Hopkinson House offers a wide range of modern amenities and conveniences to its residents while also being located within America’s most historic square mile. Because of its ideal location, the building provides panoramic city skyline vistas or tree-top views overlooking Washington Square and the streets of Society Hill. Some of the amenities include 24-hour doorman service, indoor secure parking, a rooftop (seasonal) pool, and a spacious up-to-date laundry room. The building also offers a variety of in-house activities including exercise classes, a book club, political discussion groups, a speakers’ series, seasonal holiday parties, and courtyard concerts. A spacious rooftop solarium may be rented to accommodate parties or other events. Hopkinson House is located in an area that has easy access to public transportation, a wide variety of retail options, coffee shops, art galleries, theaters, museums and concert venues. Steps away are food markets, restaurants, liquor stores, pharmacies, hospitals, medical offices, and specialty shops. More information about the businesses located at Hopkinson House, including their regular hours of operation, appear below. Ensures all building and individual owner contractors are registered, issued badges, and have filed all appropriate forms before beginning work. Responds and handles fire emergency alarms. Doorman Services – 7 a.m. to 11 p.m.
Calls and arranges for emergency vehicles when appropriate and prioritizes duties in an emergency situation. The Front Desk will sign for all packages and deliveries. Please make arrangements to pick up your USPS, UPS, FedEx, overnight packages and all other deliveries within 24 hours of their arrival. Large packages will be taken up to your unit by a staff member if they are not picked up within 8 hours. We are unable to hold packages for extended lengths of time. Please make arrangements to pick up your deliveries promptly. HHOA is not responsible for loss or damage to packages delivered to the building. The front-desk staff do not accept deliveries of dry cleaning, furs or any hanging clothing. Please make arrangements to have these items delivered directly to your unit when you are at home. Staff members will not accompany them to your unit. The front-desk staff is prohibited from holding cash for residents. Payment arrangements for housekeepers, contractors, vendors, etc. must be made by the residents directly with their service people. Hopkinson House will not be responsible for cash left at the front desk. Hotel and grocery carts are available in the main and lower lobbies for residents’ use and return. The rooftop pool season typically begins Memorial Day Weekend and ends in October. Annual membership is open to full-time residents and owners. The rules and regulations governing the operation of the swimming pool – including behavior, guest privileges, and fees – are promulgated each year by Council. Hopkinson House contracts with Towne Park to operate the Parking Garage. Monthly parking is available to Hopkinson House residents. The resident monthly parking fee for new parkers as of May 1, 2017, is $225. Please contact the Garage Manager to arrange for monthly parking. Current posted rates are $4.50 for up to 30 minutes, $9.00 for up to 1 hour, $13.50 for up to 90 minutes, $18.50 for up to 2 hours, $20.00 for up to 10 hours, and $24.00 for up to 24 hours. Residents now have two (2) options for guest parking passes. One ticket is available for $10.00 that will cover up to 24 hours of parking. Another ticket is now available – also for $10.00 – that will cover up to 8 hours of parking. Purchases are limited to three (3) tickets of each type (6 total) each month. Guest Parking Tickets may only be bought by Residents of Hopkinson House. Guests utilizing Guest Parking Tickets will still be subject to current garage regulations and /or space. Tickets can be purchased in the garage from either Jay or Paul at any of the following times: Monday 7:00 a.m. – 11:00 pm; Tuesday 7:00 a.m. –3:00 p.m.; Wednesday 7:00 a.m. – 7:00 p.m.; Thursday 7:00 a.m. – 3:00 p.m.; Friday 7:00 a.m. – 7:00 p.m.; Saturday 10:00 a.m. – 6:00 p.m.; and Sunday 8:00 a.m. – 8:00 p.m.
Cars entering the garage before 5:00 p.m. or leaving after 6:00 a.m. will be charged the posted rate for the time difference. Bike Room Storage at $36.00 per bike, plus a $25.00 deposit for a bike room key, limited to two bikes per unit and subject to capacity. If you wish to store your bike in the new Bike Room, please complete and return the Bicycle Registration and Agreement with appropriate payment to the Resident Services Desk. Apartment Storage within your residential unit at no cost to you. HHOA reserves the option of requiring you to transport your bike to and from our apartment via the freight elevator. Although many units have their own washers and dryers, the building offers a recently renovated laundry facility on the Lower Level that is open 24-hours, 7 days a week. There are 16 standard size Speed Queen washers — 8 front-loading and 8 top-loading — and 2 double-load washers. For drying, there are 16 standard and 4 commercial size machines available. The manufacturer of front-loading washers recommend that you use 1/8 of a cup of High Efficiency (HE) liquid detergent in the washers. If you choose to use the vending machine boxes of powdered detergent available in the laundry room, use no more than 1/2 a box per load and add fabric softener. For your convenience, there are large folding tables, rolling chrome laundry baskets, a detergent vending machine, magazine racks, a community bulletin board and ample seating. For safety and efficiency, all machines are activated by smart cards (added-value cards). Two card dispensers are conveniently provided by the Coinmach Company (www.coinmach.com). The well-lit room has 24-hour camera surveillance for security and free Wi-Fi. Hopkinson House contracts with Comcast to provide digital television service to the building. This service includes over 100 channels of TV programming, 46 music channels and 8 HBO channels. Also included are 2 remotes and 2 digital converter boxes per unit. This type of bulk subscription is different from a conventional residential subscriber account. Therefore, residents of Hopkinson House need to use a special telephone number to contact Comcast for all account servicing. Residents can use the regular Comcast toll-free number 1-800 COMCAST (1-800 266-2278), which is available 24-hours, 7 days a week to report service problems or a service outage. For Comcast Internet support, residents should call 1-877 637-3126. This number is available 24-hours, 7 days a week. The Solarium is an unrivaled bonus above the 31st floor. This large, bright, comfortable bi-level space is used for Hopkinson House Owners’ Association meetings, Washington Square Citizens’ League programs, and other permitted activities, including weekly exercise classes. With its functioning kitchen and sun deck, the Solarium may be rented by Hopkinson House residents for private parties, with a splendid view of the Philadelphia skyline. Press the elevator button for “R” to reach the roof level. Solarium Use Application Form. 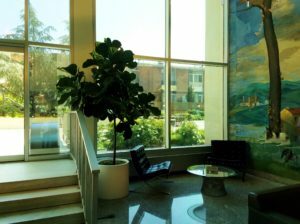 At the east end of the Hopkinson House Solarium is the Library, serving as a meeting room, reading room, conference room, and quiet room. The room’s shelves are lined with books donated by Hopkinson House residents. There is also an outlet available for laptop computers. The bookshelves hold art, history, mystery, philosophy, theology, sociology, politics, business, economics, biography, poetry, and medicine. You’ll find the “great books,” the classics and pot-boilers, in paperback and hardcover. There is no charge-out system or inventory catalog. There is no time-limit on borrowed books. A long-time resident currently serves as a volunteer librarian. The room is open daily from 9 a.m. to 10 p.m.
Hopkinson House is the designated polling place for Philadelphia’s 5th Ward, 3rd Division. Press the elevator button for “R” to reach the roof-level Solarium.